Dishing it up! : "No Mary Ellen, it's not cookies." I saw the recipe for this soup and thought it was kind of odd. You use a cooked chicken to make the broth? Weird, huh? I thought so. Well then of course I want to make it! I'm all about weird. You all know that!!! This comes from the latest issue of the Food Network Magazine Aug/Sept 2009. It is really, really good. And it's pretty fun to plop a whole cooked chicken into the pot! That aside, the soup is not to be missed. 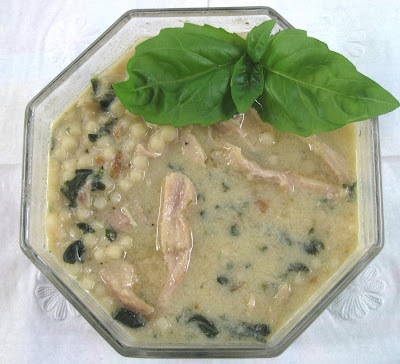 It's reminiscent of Italian Wedding soup, which is one of my favorite soups. It comes together much quicker than similar chicken soups, and I absolutely love the rich and creamy broth. I just used about a quarter of a box of frozen chopped spinach because that is what I had. It worked wonderfully. Just the right amount. For the pastina I used acini di pepe. 1. Heat the 1/4 cup olive oil in a large pot over high heat. Add the onion, 1 teaspoon salt, and pepper to taste; cook until slightly softened, about 5 minutes. Add the chicken, the broth, 4 cups water and the juice of 1 lemon; cover and bring to a boil. Reduce the heat to medium, add the pastina and simmer until the pasta is cooked and the soup thickens slightly, about 15 minutes. Remove the chicken; when cool enough to handle, pull the meat off the bone and shred into bite-size pieces. 2. Remove the soup from the heat. Whisk the juice of the remaining lemon with the whole eggs and yolks in a medium bowl until frothy. Gradually whisk a ladleful of the hot soup into the egg mixture, then stir the warm egg mixture into the soup and return to medium-low heat. Cook until creamy, about 1 minute. Stir in the shredded chicken, spinach and dill, and season with salt and pepper. Ladle the soup into bowls; garnish with feta, if desired. *When I was uploading my photo, I said to Bob that my broth was much darker than the picture in the magazine. Well, as I am typing the recipe I see that I was only supposed to use 1/2 of the chicken! I floated the whole darn bird in the broth & water!!! LOL! Oh well, no wonder the broth was so "rich and creamy"! I have that magazine, but haven't made anything from it yet. This recipe looks like a great place to start! !